Hey you guys! I’m Amy, and you can find me over at Amy V. Norris! I’m a Classics and English freshman at King’s College London and lover of everything preppy, American or book-related. Right, now that’s out of the way we can get on with the post! #1 Starbucks Stainless Steel Hammered Tumbler in rose gold - I'm obsessed with this! I've been looking for a tumbler to take coffee to class rather than leaving fifteen minutes early so I can take the route to class that passes Starbucks. I find myself wishing I'd got the Verismo instead of the Nespresso machine so that I could have Starbucks christmas blend coffee every morning, but I'll settle for buying all their syrups instead! #2 Wintery romanic comedies a la Love Actually, The Holiday, Serendipity, The Family Stone, and Elf - it’s more comedy than romantic but it’s my favourite holiday film! 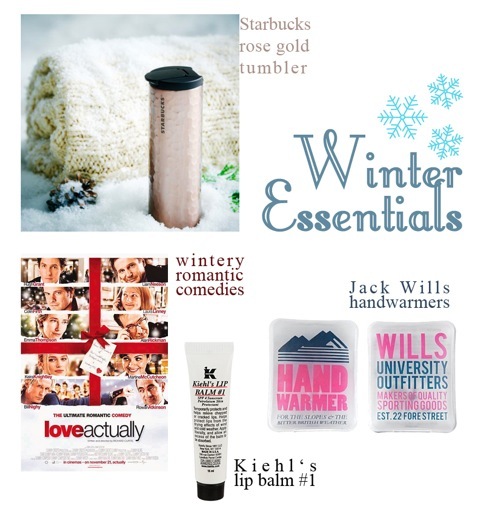 #3 Jack Wills handwarmers - It gets to the point where I debate wearing a second pair of gloves along with my five layers of clothing plus scarf and earmuffs and so these hand warmers are a life saver. You just press the little metal plate inside them, which activates some kind of chemical reaction and makes them warm up. Perfect. #4 Kiehl’s lip balm #1 - I got this at JFK airport in February for $7 and was so surprised to find out it’s £14 in the UK! I regretted buying it for a while because it’s so moisture-rich, but I’ve been applying it every few hours since the temperature has dropped, and my lips have stayed completely un-chapped! _________________________________________________________________________________ Hope you enjoyed that guest post from Amy! As you guys already know I am obsessed with her and her blog, so go check it out! I should be slaving over my finals but now I'm just in the mood to be festive and watch Love Actually! What are some of your winter essentials? Sarah I love your blog, it's one of the first ones I read on Bloglovin' every day! And your blog pairs perfectly with Amy's, American & British preppy. Your styles are so similar, I wouldn't have been surprised if this Winter Essentials list was your own! Oh that is so sweet of you to say! I'm so glad you enjoy it! And yes, Amy and I have a running list of things we both love because we are SO similar, including Love Actually! How excellent or unsatisfactory are Grab Essay online? I acquire never shared an Australian inscription benefit despite I am currently considering it. I am hoping that the authors are as salubrious also detailed as their us plus uk equivalents; are they?